Presair remote air controls offer a variety of actuator styles with a selection of colors and finishes. Presair’s compact units can sequence four functions with an air switch in less than a 2 1/4 inch cube. For safe, economical control of consumer, industrial, medical or other products and appliances in wet, chemical or explosive atmospheres, or just for added safety. Presair switches are made in the U.S.A. with world wide availability. Presair pressure, vacuum and air switches are offered in a variety of models. Our Air Switches are available to perform single or multiple functions sensing 1.5 to 3 Psi when paired with our air actuators – foot pedals or push buttons. Magictrol Sequencing Air Switch allows you to switch up to four separate pieces of equipment in sequence. 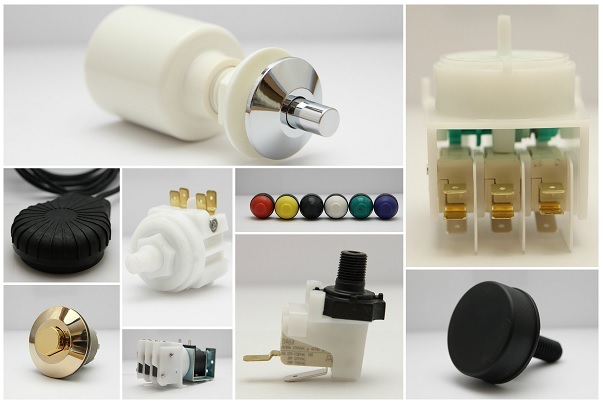 Presair also offers a line of Factory Set Pressure and Vacuum switches to sense minimal pressure up to 65 Psi. If you need to sense a larger amount of pressure our Adjustable Pressure and Vacuum switches can sense up to 125 Psi and 300 inches of water. These switches are available either field adjustable or factory set allowing each micro switch to operate at a different setting. For very sensitive pressure sensing we recommend our Sensitive Differential Pressure and Vacuum Switches as these can sense anywhere as low 0.25 inches of water – comparable to a newborn baby’s breath. These sensitive switches respond to rapid pulsing and handle low level switching currents. Lastly, we offer PC Board Mount Switch which are miniature single pole and double pole switches used as vacuum, pressure or differential switches where moderate accuracy is sufficient. These switches are ideal for printed circuit board mounting or a miniature switch option when paired with wire leads. Click an option below to view more product details, shop our online catalog or contact us!